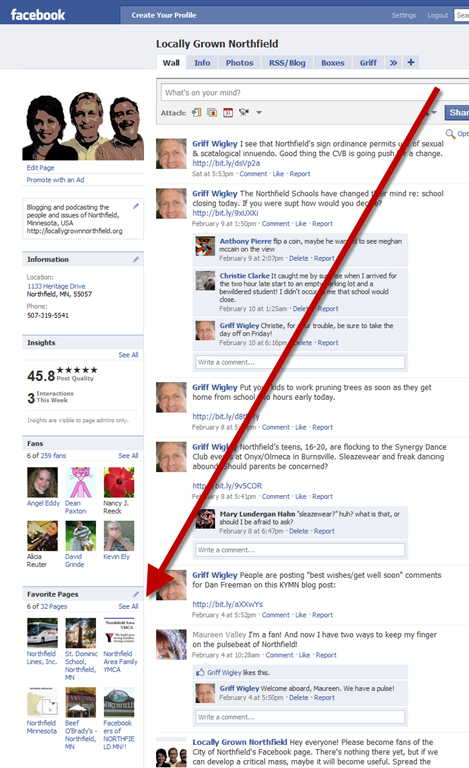 If you have a Facebook profile, you can click the Recommend button and your recommendation will show up as a one-liner on your Facebook status with a link to the blog post. Many blogs and news organizations are doing this now. For example, see this week’s MPR story on the St. Olaf memorial chime tower which, as of this writing, has 56 recommendations. If you use Twitter, you can more easily retweet a blog post. Clicking the retween button puts the blog post title in a Twitter text box, shortened with a Bit.ly URL link to the post. And if you view the individual web page for a blog post (like for this one), you’ll see some additional options for ‘sharing’ the blog post via email and other social media services. Doing this helps spread the word about a blog post. And we appreciate it. 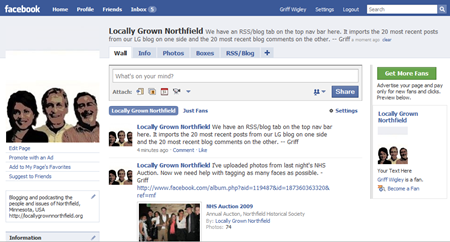 Know of a Northfield area business or organization with a Facebook Fan Page? We’ve been adding Northfield area businesses and organizations to the Favorite Pages on the sidebar of our Locally Grown Northfield Facebook Fan Page. We’re now up to 32 34 46 47 50 60 62 64 65 66 68 70 71 74 76 (we’ve stopped counting as of March 1, 2010). Let us know (attach a comment or contact us) if there’s an area business or organization with a Facebook Fan Page that’s not among this listing the listing on our new directory of Northfield area Facebook pages. 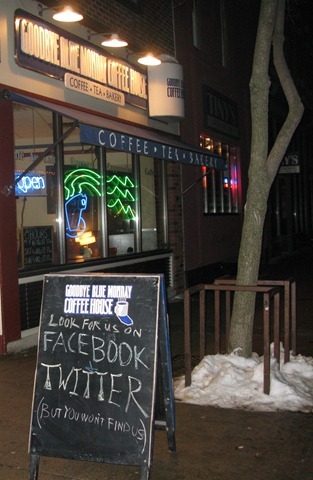 This sandwich board in the front of the Goodbye Blue Monday caught my eye, not only because it’s clever (“Look for us on Facebook & Twitter – but you won’t find us”) but because I’ve been trying to get smarter about how Twitter and Facebook can complement a blog.